20.7.1916: Launched by Cook, Welton & Gemmell Ltd, Beverley (Yd.No.342) for William Grant (64/64), Grimsby as RUGBY. 10.11.1916: Registered at Grimsby (GY994). 10.11.1916: William Grant designated managing owner. 11.1916: Requisitioned for war service as a minesweeper (1-6pdr HA, 1-7.5” A/S Howitzer) (Ad.No.2979). 24.2.1917: William Grant (32/64) shares sold to William Henry Winslow (32/64), Grimsby. 24.2.1917: William Henry Winslow (32/64) shares mortgaged to William Grant, Grimsby for the sum of £4.750 with interest at 7% (A). 11.1917: Renamed RUGBY II. Based Dover. Post 12.3.1919: Returned to owner at Grimsby. Reverted to RUGBY (GY994). 13.4.1927: Probate granted to the Executors, Arthur Grant & John Wilfred Grant, Grimsby. William Grant ‘the younger’ , Navenby and Hugh Bourne Grant, Humberstone (joint owners). 28.5.1927: Joint owners (32/64) shares sold to John Wilfred Grant (11/64), Cleethorpes; Hugh Bourne Grant (11/64), Humberstone and Arthur Grant (10/64, Grimsby. 1.6.1927: John Wilfred Grant designated managing owner. 1.6.1927: Mortgage (A) transferred to Arthur Grant, John Wilfred Grant, Cleethorpes & Hugh Bourne Grant, Humberstone (joint mortgagees). 12.8.1929: Mortgage (A) transferred to Hugh Wilfred Grant, Cleethorpes & Hugh Bourne Grant, Humberstone (joint mortgagees). 28.2.1930: John Wilfred Grant (11/64) and Hugh Bourne Grant (11/64) shares sold to The Rugby Steam Fishing Co Ltd (22/64), Grimsby. 7.3.1930: Arthur Grant (10/64) shares sold to The Rugby Steam Fishing Co Ltd(32/64), Grimsby. 13.3.1930: John Wilfred Grant appointed manager. 31.3.1930: Mortgage (A) transferred to J.W, H.B & C.A. Grant Ltd, Grimsby. 31.12.1930: William Henry Winslow (32/64) shares sold to The Rugby Steam Fishing Co Ltd (64/64), Grimsby. 16.1.1931: John Wilfred Grant appointed manager. 16.8.1932: Vessel mortgaged (64/64) to National Provincial Bank Ltd, London (B). 1.3.1934: Sold by mortgagee under mortgage (B) to Harry Robinson (48/64) shares sold to Fred Dawson Robinson (16/64), Grimsby. 14.3.1934: Harry Richardson designated managing owner. 13.3.1935: Harry Richardson designated managing owner. 7.7.1936: Fred Dawson Robinson (16/64) shares mortgaged to Harry Robinson, Grimsby (C). 11.3.1938: Fred Dawson Robinson (16/64) shares sold to Harry Robinson (64/64), Grimsby. 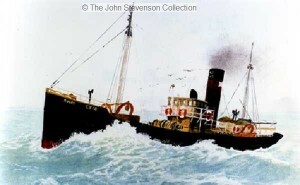 5.7.1939: Vessel mortgaged (64/64) to Arnold Arthur Beardsall, Grimsby (D). 14.8.1939: Sold to The Earl Steam Fishing Co Ltd (64/64), Grimsby. 15.8.1939: Sir Alec Black, Bart appointed manager. 30.5.1940: Requisitioned for war service as a patrol vessel (FY.4.162) (Hire rate £77.12.8d/month). Based Grimsby on Fishery Protection. 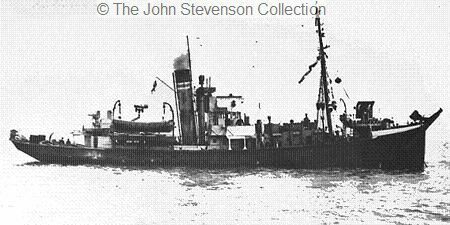 10.9.1941: Sold to North Star Steam Fishing Co Ltd (64/64), Aberdeen (John A. Harrow, manager). 22.9.1941: John Alexander Harrow appointed manager. 25.9.1941: Registered at Aberdeen (A518). 10.1941: Converted for minesweeping duties (magnetic). 7.1943: Employed on miscellaneous Naval duties. 10.1943: Fitted out as a fuelling trawler (Esso)(33ton tank for refuelling diesel landing craft) (P.No.Y7.30). 6.1944: Operation Neptune-Normandy Landings. Assigned as a fuelling trawler to Force G.
3.7.1944: Operation Neptune ended. Reverted to miscellaneous Naval duties. 11.1944: Sold to Parkholme Trawlers Ltd (64/64), Fleetwood. 16.11.1944: Registered at Grimsby (GY18). Harvey Wilfred Wilson, Grimsby appointed manager. 26.11.1944: Vessel mortgaged (64/64) to National Provincial Bank Ltd, London (E). 29.3.1946: Sold to Tilbrook Trawlers Ltd (64/64), Milford Haven (Arthur Ernest Rees, Neyland, manager). 30.3.1946: Vessel mortgaged (64/64) to Lloyds Bank Ltd, London (F). 2.7.1946: First landing at Milford (Sk. Utting). 4.8.1947: Last landing at Milford. 6.8.1947: Sailed Milford for Hull and to fish from that port. 7.8.1948: Sold to Joseph Croan (64/64), Edinburgh (managing owner). 4.1951: Registered at Leith (LH92). 1955: Sold to BISCO (£2,400) and allocated to Shipbreaking Industries Ltd, Charlestown, Fife for breaking up (Contract No.76D). 24.3.1955: Delivered Charlestown from Granton under own power. 9.7.1955: Leith registry closed “Vessel broken up”. 29/02/2012: Page published. 8 updates since then. 06/01/2019: Removed FMHT watermarks from images. This entry was posted in Steam Trawlers, Steamers (Picture) and tagged Parkholme Trawlers on February 29, 2012 by Fred Smith.